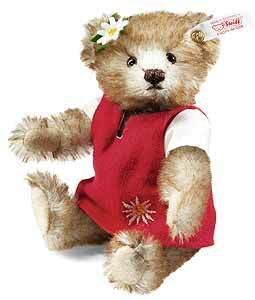 Peter Teddy Bear by Steiff. This beautiful limited edition piece in brown tipped mohair, is fully jointed, carries the white ear tag, which signifies it as a Steiff limited edition and wears the famous 110th anniversary elephant motif, gold plated Steiff button in ear. Limited edition of only 1500 pieces for the UK and Europe. Product details: safety eyes, synthetic filling material, non growler, total size 15cm. Comes boxed, together with a numbered certificate of authenticity. 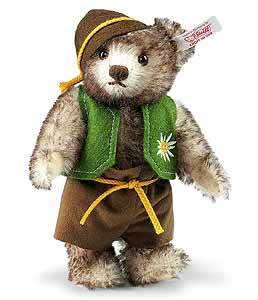 Peter by Steiff is a wonderful interpretation of the character, in the famous novel, "Heidi". Published in the same year that Steiff was founded, that being 1880, It is a touching story of an orphan girl raised by her grandfather in the Swiss Alps. With more than 50 million copies sold and you can now own your very own Steiff Peter, together with the title character from the novel, Heidi.